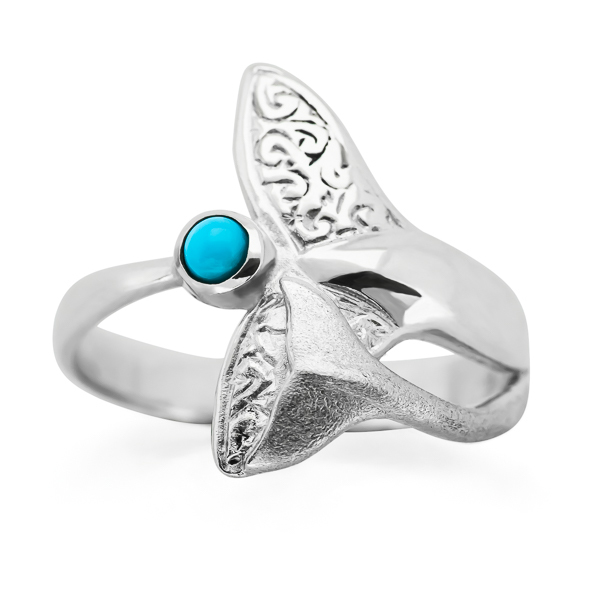 This handcrafted whale tail ring features the majestic fluke of a mother humpback overlaid with the smaller fluke of her calf and set with a single circular turquoise stone. Designed to capture the special bond between a mother and her young, the ring is named after Hervey Bay’s very own iconic humpback whale, Nala, and her calf Mirrhi. The large fluke is hand engraved with a fine filigree design, while the smaller fluke is textured to create a stunning combination of finishes. I am extremely pleased with my Nala and Mirrhi ring and I’ve received many compliments while wearing it. The ring has gorgeous attention to detail and is of high quality. I’m now debating what to purchase next from World Treasure Designs.